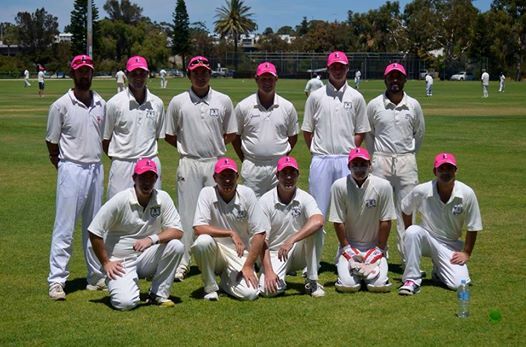 Mike Jones joins Dodger and Billy Hussain in playing for Fremantle Mosman Park Cricket Club (PIRATES). Mike plays for FMPCC this winter. Here is Mike receiving the FMPCC colours. Many thanks to everyone who completed the survey on the Staffs v Worcester debate. The results are published here and were the subject of discussion at the General Committee Meeting on 4th September 2014. After due consideration, it was decided that we should retain our membership of the Worcester League for both third and fourth teams. The possible leagues for both teams in 2015 could involve a significant reduction in travel. In addition, the Worcester League have commissioned a survey to all clubs, and one of the questions is on the regionalisation of the league. We will be lobbying very strongly via this survey for a return to the North-South division we enjoyed when we first joined the Worcester League. Q1 Is travelling currently an issue for you? Do you know any adult cricketers who may be interested in joining the club? Which is your preferred league for our third and fourth teams? 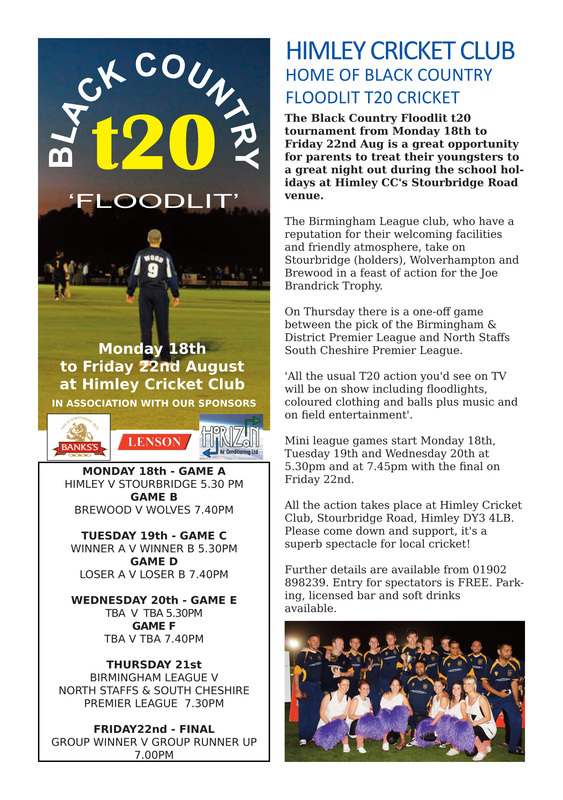 HIMLEY TAKE THE HONOURS IN THE BLACK COUNTRY FLOODLIT T20. Worcestershire batsman Tom Kohler-Cadmore produced fireworks to inspire Himley to a home victory in the final of the Black Country Floodlit T20 against Brewood. The 20-year-old blasted a stunning 72 from 24 balls at the start of the game and his side never looked back as they claimed a 68-run triumph. Himley, who host the four-team competition that this year also included Wolverhampton and Stourbridge, posted 210-7 in their 20 overs. Brewood always found themselves playing catch-up and were dismissed for 142, which included 54 from Atiq Chisti. Stuart Wedge claimed five wickets for Himley. Hundreds of spectators flocked to the Stourbridge Road Ground to witness the end of a five-day event that included music, coloured clothing and floodlights with teams competing for the JW Brandrick Trophy, presented by club president Joe Brandrick. The former Albion director has been associated with Himley for 55 years. Kohler-Cadmore provided an explosive opening to the Himley innings as he teed off from the outset, compiling a stand of 79 inside five overs for the first wicket with Nathan Round, who went on to make 28. Kohler-Cadmore’s brief but spectacular innings included eight fours and six sixes and saw Himley rack up 23 off the first over of the match. The removal of the Worcestershire man slowed the Himley scoring rate and they added fewer than 100 from their final 10 overs after racing to 118-4 at the halfway stage of their innings. But Kuldeep Diwan made 48 from 33 balls, Jamie Harris hit a useful 18 while Sandeep Dhillon was unbeaten on 19 as he guided his side past 200 to help set Brewood a daunting target. Brewood’s Jamie Lunn almost claimed his second hat-trick of the tournament after claiming his first against Wolverhampton on Monday. He took 2-44 from his four overs while Richard Wissing took 2-34. Brewood reached a respectable 98-3 at the 10-over mark with Captain Cameron Fox, the tournament’s leading run-scorer and a former Himley player, having been bowled by opposite number Greg Wright for 17. They were reduced to 132-8 off 15 overs despite Chisti bringing up his 50 from just 21 balls. That left them needing 79 from the final five overs with just two wickets in hand – a task that proved too tough, with Wedge claiming the final wicket. Kohler-Cadmore and Wedge were named joint man of the match. Fox was crowned player of the tournament. BLACK COUNTRY FLOODLIT T20 CRICKET IS BACK! ​Leading the Midlands - and arguably the country - in the format, floodlit t20 cricket returns to the Black Country for a 5th edition, from Monday 18th - Friday 22nd August, 2014. The competition is a great opportunity for parents to treat their youngsters to a great night out during the school holidays at Himley CC's Stourbridge Road venue. Hosts Himley face holders Stourbridge and former winners Wolverhampton, with a Birmingham League quartet of entrants made up by Brewood. This fantastic concept see’s all the regular t20 trimmings -coloured clothing & balls, floodlights, booming music and fireworks – played out for the J.W. Brandrick Trophy. Wolverhampton skipper and former winner, Simon Lycett, commented: “We are delighted to have been invited, once again, to play in the Black Country t20 Floodlit tournament at Himley CC. It is fast becoming one of the most talked about tournaments in the local area and one in which the lads really enjoy being involved in. Lycett, who has played each year since 2010 and has overseas Indian International, Wasim Jaffer, available added: “It's great that local players can be involved in the fast paced drama of t20 cricket under floodlights, against the players that we play against each week in the league. It's a chance for new players to the league to showcase their skills and we are looking forward to mounting a challenge for the J.W. Brandrick Trophy. To add to the spectacle, this year’s Thursday night feature game is as big as it gets for regional club cricket, as the pick of the Birmingham & District Premier League host the stars of the North Staffs & South Cheshire Premier League for the bragging rights in Midlands t20 cricket. Further details are available from 01902 898239. Entry for spectators is FREE. Parking, licensed bar, food and soft drinks available every night. The Floodlit t20 would not be possible without the our sponsors: Banks's, Horizon Air Conditioning, Lenson Select Ltd, Sound Junkies, SR Portraiture, Morris Site Machinery and Hawk Cricket. Please click on our sponsors logos for information about their services. We would also like to thank our President, Joe Brandrick, for his generous sponsorship of the awards over the past five years and donation towards running this year’s competition. 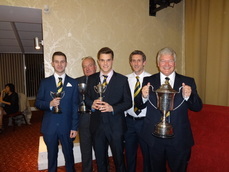 A large contingent from Himley CC attended the Midlands Club Cricket Conference Annual Dinner at Tally Ho in Edgbaston to see 6 of our players/administrators receive recognition for their efforts in 2013. Ryan Brown and Jamie Turner (who is still in Oz) shared the MCCC Under 21 Cricketer of the Year Award for the impact they had in the BDPCL Premier League whilst another of our great youngsters, Ollie Westbury scooped the The Alec Hastilow Trophy for the most promising cricketer under the age of 16. As a result of his creation and management of the annual Black Country T20 Floodlit Competition Greg Wright was deservedly recognised for raising the profile of club cricket in the Black Country. Our Junior Chairman, Guy Whittaker collected the Halesowen Trophy for his contribution to junior cricket over the years and last but not least our Treasurer, Steve 'Walks' Walker came home with the Tiny Wildsmith Club Person of the Year for all of the work he does in and around the club, putting back into the sport he loves (he's the one with the biggest trophy!!!!!!). On behalf of everyone associated with Himley CC - well done guys, you've done us proud. 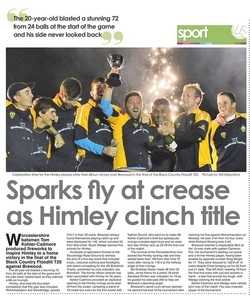 In 2012, when two of Himley Cricket Club's five senior teams gained promotion and the club won the Black Country T20 title in style, few expected that the 2013 season could bring even greater success. Himley’s junior section had other ideas, however, and went beyond all expectations with an incredible series of achievements across all age groups. 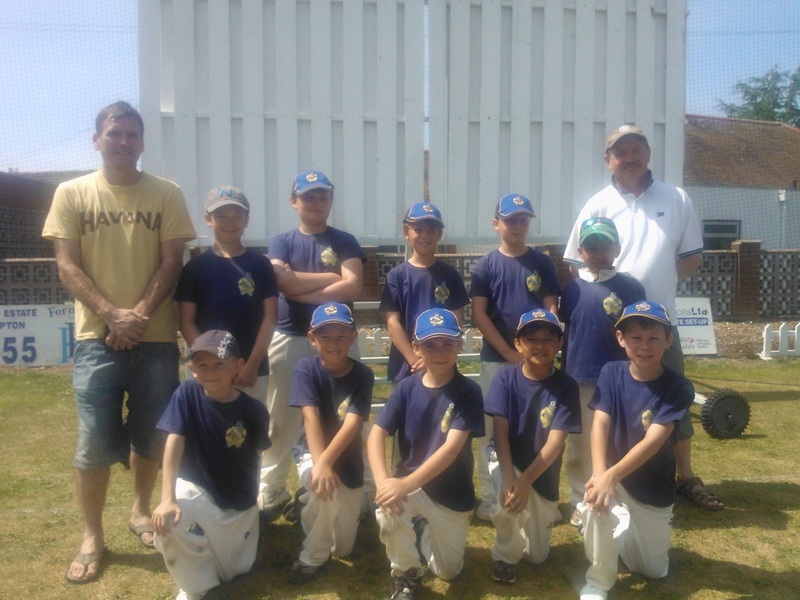 Playing at Wombourne, Himley Under Nine’s (Lions) were unbeaten in all of their 16 games going on to win the County U9 softball tournament. 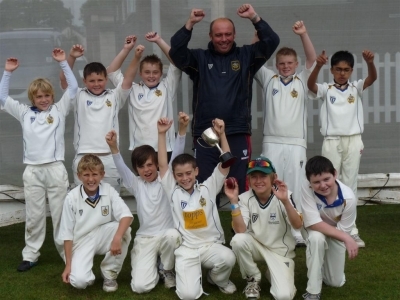 The Under 13’s, a team that has been playing together since they were seven years old and had 11 of its squad playing representative cricket, went on an amazing streak - winning the U13 Worcester Cricket Board competition by nine wickets, finishing runners-up in the Reg Barber Memorial Trophy, finished Worcester Cricket Board Premier League runners-up - crowned Midlands Champions after beating Dunstall (Derbyshire), Ombersley (Worcestershire) and Whitchurch (Shropshire) in the regional final and thus represented Staffordshire in the ECB National Competition. Beating Whitchurch in the regional final earned entry into the Finalists National Competition held at the Shrewsbury School, where Himley’s under 13’s finished a very creditable fourth out of the 1,700 entrants who started the competition. Himley’s U15’s chipped in by finishing champions of the Worcester Cricket Board Northern League, beating Rushwick by 72 runs in League Cup Final at Feckenham, having reached the final by winning all of their games in the North Division. Himley’s U16’s kept up the good work too, finishing champions of the North Worcester League and going on to beat Beacon CC and Old Elizabethans CC to become Lord's Taverners Midlands Champions. Individual plaudits went to Ollie Westbury, who received the North Worcestershire U16 Player of the Year accolade. Completing a really special 2013 season, Himley’s U17’s finished runners-up in the Worcester Cricket Board Cup, making sure that the club had competed in all competitions, across all age groups. In addition to the trophy’s and silverware, 36 boys and girls played representative cricket, two making Worcester First Class Academy, one making the England Performance Programme and two juniors reaching the last 24 for national squads. 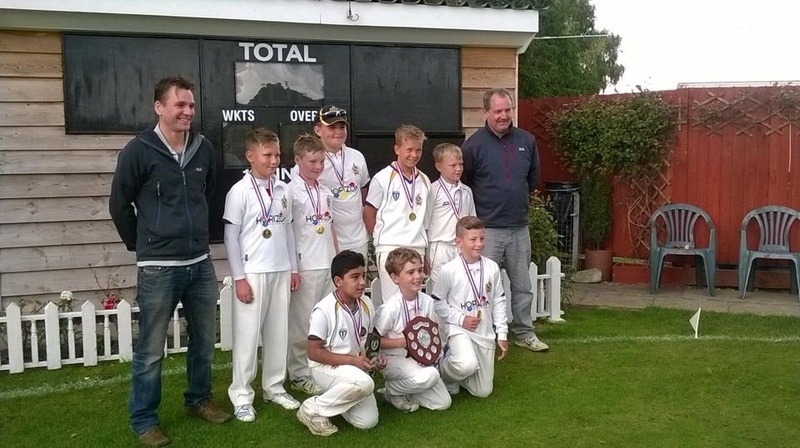 All in all, it represents a fantastic achievement, a credit and testament to the coaches, helpers and parents who put in a tremendous amount of time in keeping Himley Cricket Club very much in safe hands. 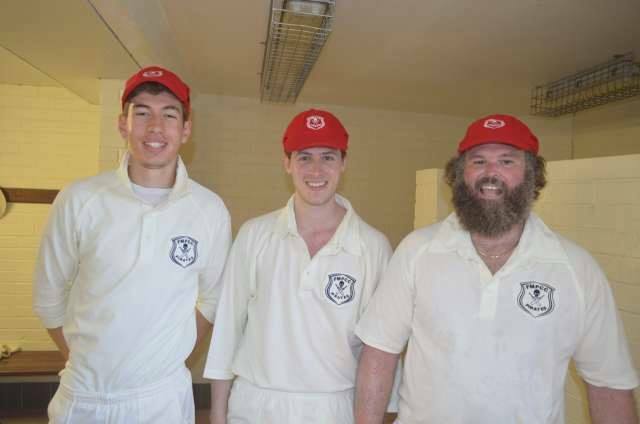 Fremantle Mosman Park Cricket Club's Mark Brian being presented with a Himley CC training shirt by the Himley C. C. tourist's Jamie 'Dodger' Turner, Billy Hussain & Olly Wright. ​Dodge and Billy have been wintering down under and on behalf of everyone at Himley we'd like to say a big thanks to the Pirates for their hospitality and the introduction to the Aussie way of life our lads have been given at Gil Fraser Reserve.